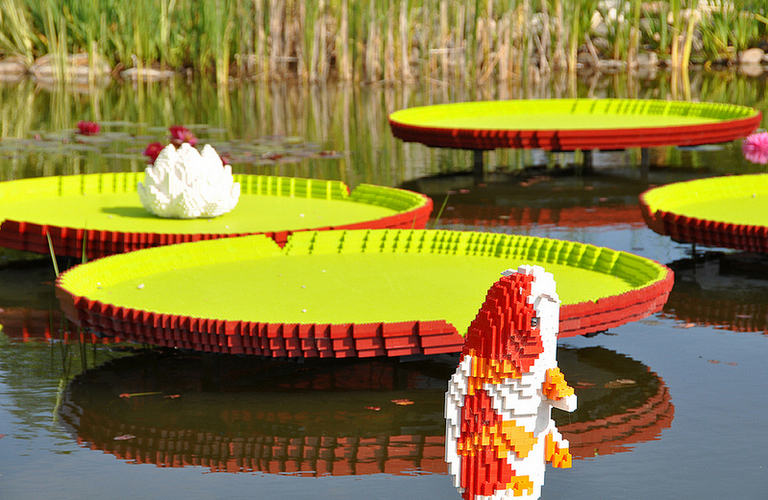 Kids and parents alike will enjoy and appreciate the new Nature Connects: LEGO Brick Sculptures exhibit going on right now through September 29, 2013 at Powell Gardens in Kingsville, MO. This newest exhibit features over 500,000 LEGO bricks all perfectly built to display butterflies, birds, and even bison! The work of Sean Kenney, one of only 13 LEGO Certified Professionals in worldwide, is on display and there are also other fun LEGO-themed activities, stories, performances, and more that will tie in with the brick-building fun. Entrance to the exhibit is included with regular admission to Powell Gardens, which is $10 for adults, $9 for seniors, and $4 for children ages 5-12. There is also free parking. Want to win FREE passes? We're giving away family 4 packs of passes! The passes to the exhibit are not valid during festival dates (July 3, August 2-4 & 9-11) but otherwise good any time from June 1 through September 29, 2013. To be entered to win, first subscribe to our free weekly e-news and then leave us a comment here about legos, Powell Gardens, or just about anything your heart desires! TWO lucky winners will win a family 4-pack of passes to visit the exhibit. Good luck! Legos & Powell Gardens - what a GREAT combination! Everyone in our family would enjoy a visit to this fun & beautiful exhibit. My kids would love to see the giant legos! New to the area and have never been to Powell Gardens. Would love to go and see the Legos! My kiddos would love it!! My three kiddos would love to go! My son would love this exhibit! I would love to take my daughter to Powell Gardens! You can't go wrong with Legos and cool gardens! Oops, I didn't mean to post my email as my name on my last post! If an admin wants to delete that one, it would be great! LOL! My three kids would love to go! I haven't been to Powell Gardens in quite some time and would love to go again :). Sounds like an interesting display. Thanks for the opportunity to win. Never been. Would love to go! We are so excited to see the Lego Sculptures this year. Each year the exhibits at Powell Gardens are so wonderful! We have never been to Powell Gardens would love to go! My daughter loves legos. My 3 kids would love it!!!! Love this idea of lego's at Powell! My son loves LEGOs and I love getting my family outside! Would love to see the Lego sculptures at Powell Gardens. Powell Gardens was a big part of my childhood, and I'd love to share it with my daughter, too! We love Powell Gardens and legos! Can't wait to see them together! Legos and Powell Gardens, what a great combination! My boys would love to go.